Program completely updated with a fresh new look and updated content. 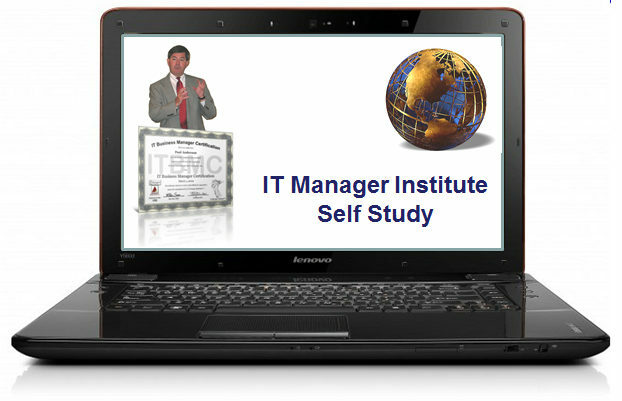 The IT Manager Institute Self Study is one of the most successful online programs designed to help IT managers of the world achieve more success. The online format makes the proven resources available to any IT manager in a cost effective manner. 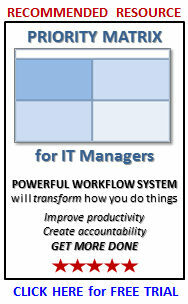 Work through the program at your own pace and eliminate the cost of travel or time away from your office. 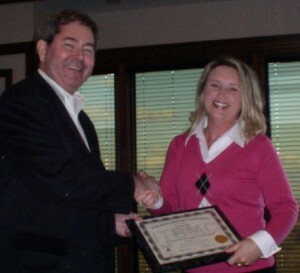 Participants receive the same presentation material we deliver in the classroom version. 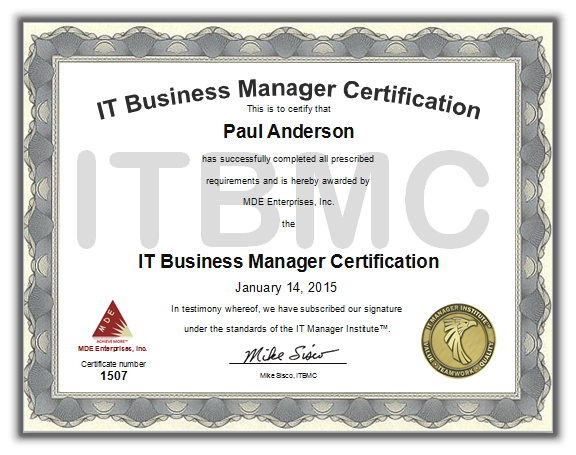 Pass the ITBMC exam and receive IT Business Manager Certification (ITBMC) recognition. 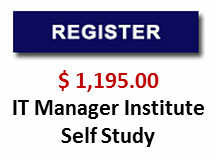 Plus, you also receive BONUS resources valued at over $1,000.00. 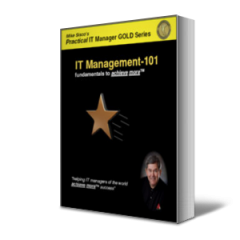 The program follows a structured IT Management Process™ and includes all the management tools you need that will give you guidance and confidence in managing any IT organization. The key to success is knowing what to do and what you can do. Follow a proven formula to determine the needs and issues of your business client plus your IT organization’s capability and capacity to support the client. Only then can you develop an appropriate IT strategy. We will share an IT assessment process and tools I developed to help me conduct over 40 company acquisition assessments. A case study will make it all very real. Delivering projects successfully is the key to credibility. 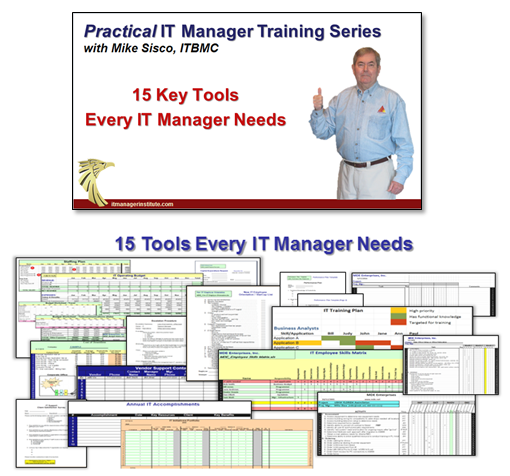 Use simple techniques and tools to manage projects effectively and you will separate your organization from others. 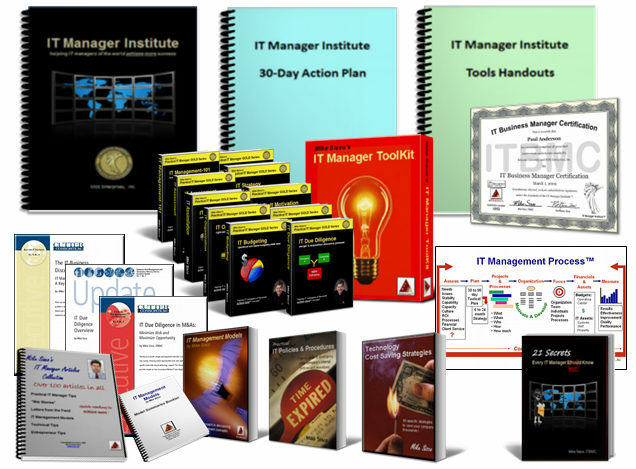 Included are tools and templates that help you manage successful projects as well as project portfolio resources to communicate project status and value derived from your IT efforts. Build an appropriate team and “right-size” your IT organization to support the business. Start by conducting a skills inventory that defines both the skills you need on your team and what you have. Understanding this allows you to focus on the gaps to start achieving more success quicker and more reliably. Learn to motivate your staff like never before and with little or no money. Motivating employees doesn’t require lots of money, but it does require an understanding of what motivates IT employees and knowing how to go about it. You may not realize it but teamwork is not a natural thing nor easy for most IT employees. Learn why and use a few proven techniques to build a world class support team. Motivated employees can do powerful things and they will “walk through fire” for their manager. Budgeting must become a skill of every IT manager because the key to the hearts of senior executives is the financial side of the business. A quick accounting primer gives you the basics of what you need to understand about senior management’s perspective and the tools they use to monitor a company’s financial performance. Then you will learn to use simple tools and techniques to streamline your budgeting process and develop budgets you can be highly confident in achieving. Budgeting will be much faster and easier with insider knowledge and tools I’ll give you. Tracking technology resources of your company is an important part of managing your IT support business. Get organized and keep it simple. These straightforward processes and tools will help you manage this part of your business in an effective way. Every company has significant cost saving and productivity improvement opportunities, , , and your IT organization offers real leverage across the company you should take advantage of. 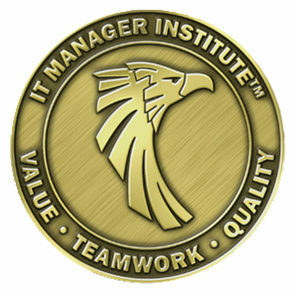 Learn where the leverage points are and go after cost savings and productivity improvements that more than pay for your IT Manager Institute class. Key measurements can help you better understand your IT support business and improve your support focus. Learn to track and report meaningful data. Simple tools will help you show IT value and the successes you are achieving in such a practical way you will wonder why you haven’t been doing this already. Communicating effectively is more about knowing what to communicate and how to present it than anything else. It is one of the key skills that can literally boost your career. A major challenge is that most IT managers aren’t strong communicators nor do they see the need to be. Use our simple techniques to improve your communication skills and start developing stronger relationships with your clients.